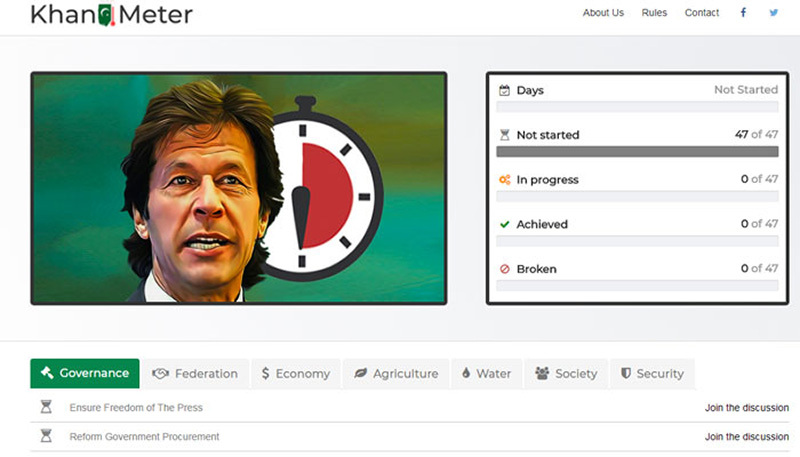 In order to keep track of newly elected Prime Minister of Pakistan, Imran Khan’s performance as the nation’s new leader and the promises he made under the ‘100 days’ agenda’, a new Website has been launched on the web namely ‘Khan Meter’. 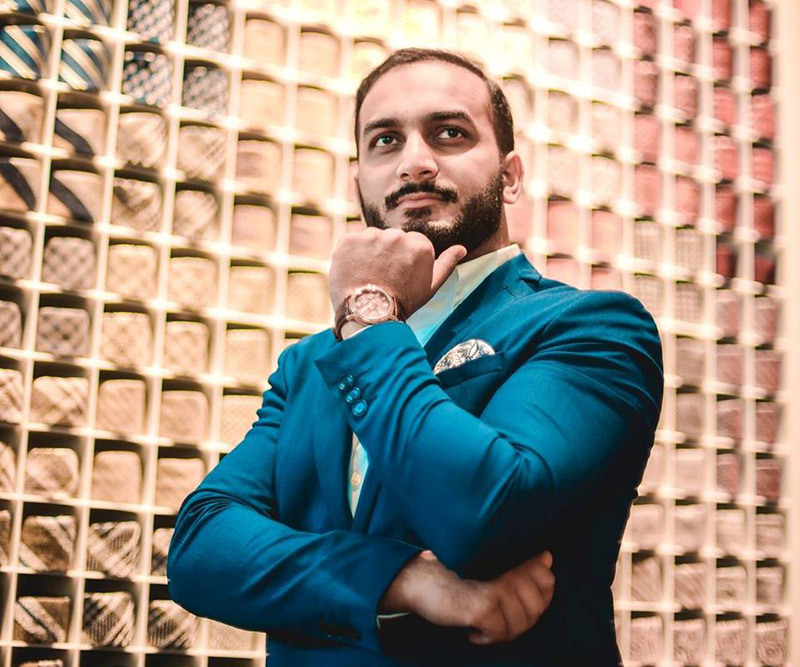 Inspired by the idea of Obamametre, Pakistani social entrepreneur Salman Saeed has started the unique Website to gauge and monitor the efforts of Khan’s political party Pakistan Tehreek-e-Insaf (PTI) after coming to power. The Imran Khan Meter PTI 100 Days Reforms Agendum has a detailed breakdown of all the provisions Khan proposed under his agenda divided into seven categories. Salman Saeed decided to develop the Imran Khan Meter PTI 100 Days Reforms Agendum when there was a widespread discourse for tracking PTI’s promises. 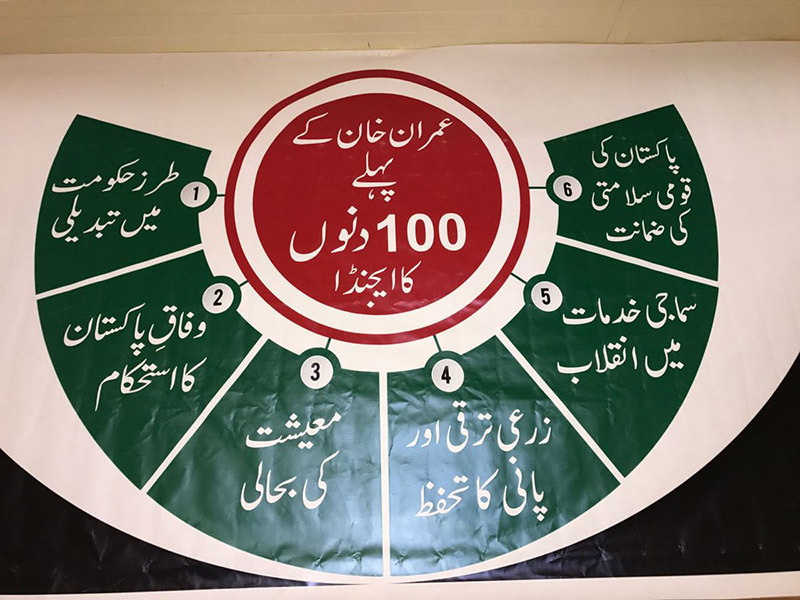 The Imran Khan Meter PTI 100 Days Reforms Agendum is divided into the number of days passed, the number of goals that have not been addressed, and the number of promises that are in progress or have been achieved or broken. Currently, the meter stands uninitiated as Khan has yet to take the oath as the Prime Minister and prove compliance with his commitments. Every category of Imran Khan Meter PTI 100 Days Reforms Agendum has different indicators to evaluate the campaign pledge of the PTI chief, who is set to take oath as prime minister in August with a tough task, during the first 100 days. The Website also has a discussion space for each category that allows the public to comment on the progress of PTI’s progress, and express their opinion on the governance challenges in the way of achievement of the 100-day plan. Saeed is now planning to extend the Imran Khan Meter PTI 100 Days Reforms Agendum from 100 days to the whole tenure of the new government. The extension is aimed to incorporate the complete manifesto of PTI devised for General Elections 2018. He believes that we only vote political leaders and forget about monitoring the promises they make during election campaigns. “We have been voted the political leaders to power in the past but we forget about the promises they made to us during election campaigns”. He added that the Pakistanis did not try to know the reasons if the rulers failed to commit their words. This time Pakistanis have voted Imran Khan to power as he made promises which focus on the development of human beings instead of infrastructure, he said, adding that the Khan’s fascinating pledges pushed the overseas Pakistanis, who usually did not cast their votes, to come back to choose their leader. Many other people in Pakistan also used their right for the first time. “Those who have elected Imran Khan and his team are active now to keep any eye on their performance after they form the government in the federation”. The young organizer of the Website said that he extracted points from the Khan’s 100-day plan and enlisted them on the Website where people can check the progress on them. He also invited the people to give suggestion if any information is missing on the Website. To visit the Website Click Here.